Due to the warmer temperatures this year, The Discovery Channel has moved Shark Week up from the usual early August spot, to early July. As promotional luck would have it, sharks are in abundance this year on beaches across North America. The warmer waters have enticed the hungry man eaters to head further north earlier than usual, recording EIGHT shark attacks on the Carolina Coast so far this year. George Burgess of the International Shark Attack File, urges humans to “GET OUT OF THE WATER”. Warning heeded. 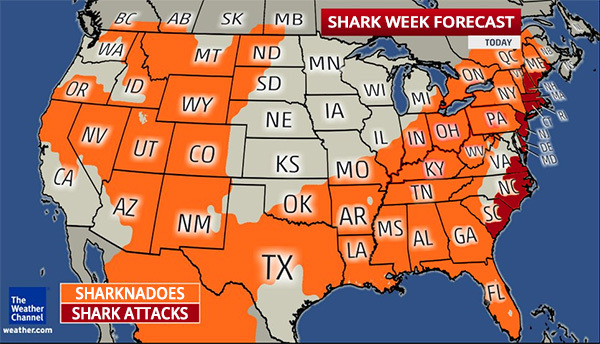 Interestingly enough, the California Coast’s main threat is the occasional “sharknado”. Self-proclaimed “Shark Whisperer”, Jerry Reefer, explains that, according to his sources, “Californians don’t taste as good as those East Coasters.” Reefer quips, “it must be something in the water”, as he takes a drag from his prescription medication. Discovery isn’t the only cable network getting in on the shark action. SyFy and The Weather Channel have as well. SyFy is set to release the third of the Sharknado documentary series, Sharknado 3: Oh Hell No!, on July 22nd. 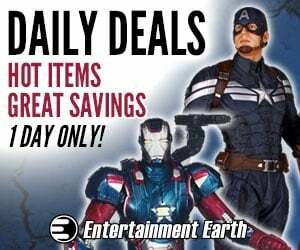 A spokesperson for SyFy said that the fourth in the hit franchise will be filmed this summer, as the weather cooperates. The “Shark Week Forecast”, courtesy of The Weather Channel, calls for East Coast shark attacks, as well as pop-up sharknadoes across the United States and Mexico, and some southern portions of Canada.